DAP can be installed like a regular WP plugin using the DAPEasyInstaller plugin. This plugin supports both ‘new install’ as well as “upgrades”. 1. Your access to DAP support / upgrades should be current. Click here to check if your access is current. If your access to dap support/upgrades has expired, you can renew it here to be able to use this plugin. 2. In your php.ini file, upload_max_filesize should be set to 32M or more. Please confirm this with your webhost support. They can update this setting – if needed. 3. The easy installer plugin does not work on some sites. It could be due to security plugins that prevent file uploads, file/folder permissions or php settings. 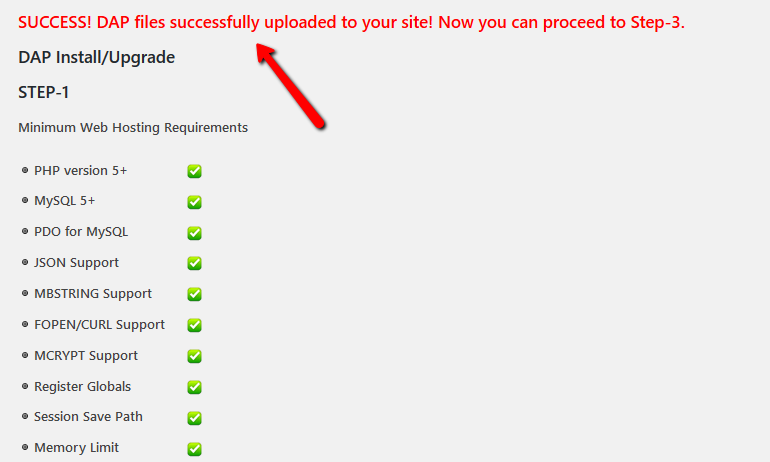 If the easy installer plugin does not work on your site, you can use “ftp” to upload files. Details here. 1) Download the Easy Installer Plugin (version 2.x or above) from your members area to your desktop. 3) After you activate this plugin, you will notice a new DAP Easy Installer Option under WP Admin -> Settings. If not, then unfortunately you’ll have to use “FTP” or “File Manager” (in your webhost cpanel) to upload files. On some servers, the file upload does not work due to permission issues or file/folder ownership issues. You can’t use easy installer on these servers. Click here for detailed instructions. good idea and great execution. Make it easy on us and on tech support. One thing I thought would be another good step – since for new installs the PERMALINKS steps is vital – I would add that as a step to link to the PERMALINK page for New Installs – this way it never gets missed. keep up the wicked work! Yes, makes sense. Will include it in the next update of this plugin. If I’m just upgrading, do I need to change the Cron settings again, or will the old settings still work? >>If I’m just upgrading, do I need to change the Cron settings again, or will the old settings still work? << Old settings will still work. Awesome! Now THIS is the kind of admin functionality I LOVE seeing. I just upgraded and it was a breeze. Thanks!!! This makes it so easy…thank you! Oh ya. Amazing Easy Installer. And now there is a Doctor in House! Looks like you are using another plugin that’s also using the same Stripe library. 4) Now activate remaining plugins and the error should go away. just wanted to ask if it is necessary to update Step 4 Cron for the website? If you are upgrading DAP from one version to another using the easy installer, you don’t have to update cron. If it’ a new install, yes, you need to setup cron. DAP Hourly Cron sends out all the scheduled broadcast (bulk) emails and processes different types of “bulk actions” – like importing a large list of customers into DAP from an external system, affiliate commission processing, other cleanup etc. Great job with the plugin! I was worried about the install for something this important. I am NOT a techie. The whole thing installed in minutes. That’s only because I watched the tutorial first. I hope everything else is as easy.